PREMIER Division side Ilkley Town have applied for promotion to ‘Step 6’ for the 2019/20 season. Currently fourth, Ilkley are on a three-match winning run in the league which has seen them close to within seven points of third-placed Leeds City. Speaking about the bid, manager Simon Armstrong said: “We have our new 4G facility which we used as our home pitch for the application. It has the correct surroundings, floodlights and spectator areas. “We still need to do some work in regards to changing facilities, so we’re going to work in partnership with Ilkley Grammar School to refurbish the Ilkley Grammar Pavilion which is very run down. Some form of covered stand is needed for promotion, but Ilkley also have a plan for this. “Part of the application is to include some sheltered standing within the pavilion,” Armstrong explained. Ilkley could be placed into the Northern Counties East League or the North West Counties League if promoted and, while the club have a preference, they accept the final decision lies with the FA. “We would like to go into the North East Counties, that’s the league we prioritised,” said Armstrong. “But I know it is down to the FA and where they see us fitting in based on geography. “There are six or seven teams applying to go into these two leagues, so we have to try and get our facilities ready by March 31st. “It will be a challenge; there are no guarantees at the moment that we can achieve it. But, we are going to push for it. “Beyond that, we would then need to be accepted and approved to join one of the leagues, both of which are very competitive. So, it’s by no means a done deal, it is something we are working towards. I’d say it’s 50-50 at this stage as to whether we pull it off. Ilkley were in cup action at the weekend, meaning Leeds could take a rest from having them snapping at their heels. City took full advantage, stretching their gap to seven points over Ilkley with a 5-0 win against Sherburn White Rose. Adam Fowler netted twice, while Adam Dutson, Charles Lumley and Joe Tasker were also on target. Carlton Athletic and Beeston St Anthony’s are starting to break away and make it a two-horse race for the title. The pair entered the weekend level on points at the top, and that’s how it remained after their 2-2 draw at Carlton Cricket Club. Salts chalked up a rare result with their 4-1 win at Wyke Wanderers lifting them off the foot of the table, meaning Wyke replaced them at the bottom in a straight swap. Hunslet also ran out 3-1 winners at Field. Boroughbridge were knocked off Division One’s top spot after their surprise 4-2 home defeat to Oxenhope Recreation, writes JAMIE WOODHOUSE. James Bailey netted twice for Oxenhope, while Scott Nelson and Lee Reilly ensured they would depart with all three points. Hall Green United took full advantage to become the new league leaders. 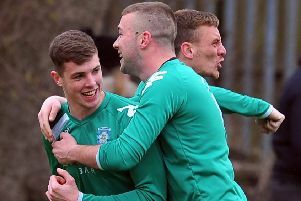 Kyle Schofield put Hall Green ahead against Rothwell after only six minutes, while Adam Higgins’ strike and a 14-minute hat-trick from James Cusworth made them 5-1 victors. Newsome are now only two points off the summit after their 4-1 over Kippax. Steven Marshall, Jamie Jobarteh, Darius Matheson and Curtis Roberts were all on target for Newsome. Kirk Deighton Rangers picked up their third consecutive league win with a 4-1 triumph over Leeds Modernians, while Wetherby Athletic’s revival continued with a 4-3 victory at Featherstone Colliery. East End Park thrashed bottom-club Howden Clough 6-0. Glasshoughton Rock moved back up to second in Division Two on goal-difference after their 7-0 win at Brighouse Old Boys. Jamie Simpson claimed a hat-trick, while Liam Kellett chipped in with a brace. Richard Kingsbury and Ben Rudge completed the drubbing. Leaders Campion Reserves and third-placed Shelley Reserves were both excused from league duties over the weekend, but it appears a fascinating battle for the Division Two title is set come the business end of the season. Swillington Saints moved to within three points of Shelley after their 4-3 win at Ripon City while fifth-placed Huddersfield YM enjoyed a 5-0 victory over Hunsworth. Baildon Trinity Athletic remain bottom after their 4-0 loss to Altofts, while Knaresborough Celtic played out a 3-3 draw with Kellingley Welfare.